Hypostome means “under mouth”. On trilobites it is found underneath the cephalon (head) near what we think was the mouth. They are not common in the fossil record. It is obvious from their color and composition that they are part of a trilobite, but most people don’t know about this little plate on the otherwise soft underside (the ventral side) of the animal. The hypostome is important in some new taxonomic schemes for sorting out the trilobites (Fortey, 1990), and they are useful for interpreting a particular trilobite’s feeding habits (Fortey and Owens, 1999). Trilobite hypostome forms from Wikipedia (via Obsidian Soul). The small green plates are the hypostomes seen against the gray cephalon above. A – Natant: Hypostome not attached to doublure; aligned with front edge of glabella (shown in red broken lines). B – Conterminant: Hypostome attached to rostral plate of doublure. Aligned with front edge of glabella. C – Impendent: Hypostome attached to rostral plate but not aligned with glabella. The hypostome of Isotelus is attached to the anterior edge of the skeleton (thus “conterminant”) and has two distally-directed prongs (making it “forked”). 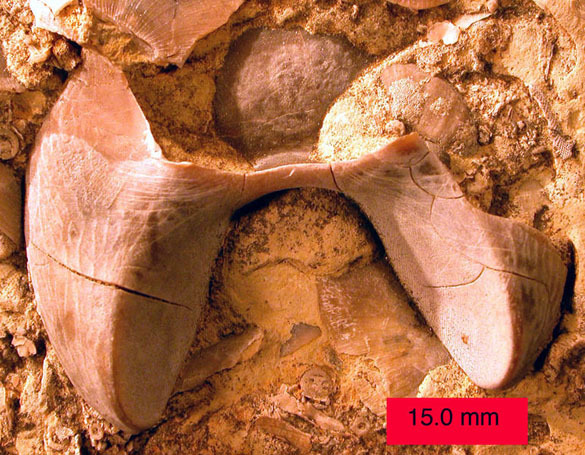 Hegna (2010) has recently suggested this hypostome with its unusual shape and terraced outer structure may have been used for grinding food rather than serrating it. Turns out our hypostome has a unique form among the common trilobites! Fortey, R.A. 1990. Ontogeny, hypostome attachment and trilobite classification. Journal of Paleontology 33: 529-576. Fortey, R.A. and Owens, R.M. 1999. Feeding habits in trilobites. Palaeontology 42: 429–65. Hegna, T.A. 2010. The function of forks: Isotelus-type hypostomes and trilobite feeding. Lethaia 43: 411-419.